Liz Maddalena joined KBBH in 2006 seeking the opportunity to merge her success in the US Air Force and fast-paced corporate world with an opportunity to put her service-focused heart to work creating impact for others. Liz brings a unique ability to transform big ideas into sound strategy development with her business management acumen and financial direction and was instrumental in building KBBH’s capacity for expansion. Her authenticity, accountability, stewardship of resources, and extensive knowledge of business governance and organizational management grounds KBBH’s core competencies in intelligent business strategy. With Liz at the helm of operational leadership and oversight, KBBH remains positioned to provide the most needed services to Klamath County despite ever-changing resources and priorities. She has a passion for nonprofit service delivery and keeps KBBH fiscally healthy with her negotiation skills, logistics management abilities, and strategic insight. 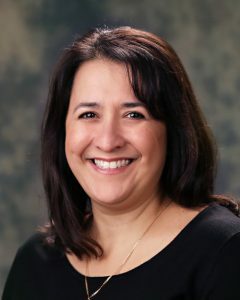 Born to Portuguese immigrants with a strong Catholic faith, Liz balances her stellar work ethic and commitment to excellence with equal value on large family dinners, enjoying her adult children and granddaughter, volunteering in her church, and traveling to her family home in the Azores with her husband of 30 years.